In making my triple-color raked (feathered) glassblowing footed bowls last semester, I needed to cut a bunch of glass bar (“color rods”) into small sections. To make that process easier for next semester, I wanted to make a simple apparatus, and I believe I succeeded, and it cost me nothing, since I had the few items I needed as left-overs from other projects. The photo below is shown with a bar of Reichenbach R-95 Opal Black (which reduces to a beautiful metallic silver color). For size reference, that bar is 1.25″ in diameter and over 11″ long. 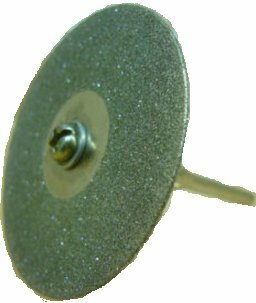 I used a 40mm diamond cut-off wheel in a hand-held Dremel rotary tool to cut (under running water) a bit of a “score line” or “slit” at the spot where I want to break the rod. This gives me control over the size of the chunks. To mark off evenly-spaced sections, it is easy on the light-colored bars to use a Sharpie marker, but on the dark-color bars like black, I use 3/4″ wide tape to mark off each section to be cut, cutting in-between where I have marked with tape. Below you can see that I am using a chisel at the point of the slit, and that is positioned over the apex of the right angle steel. I can’t remember if I made my tool out of solid gold, or if I used scrap steel and spray-painted it with Rustoleum Gold “Bright Coat” Metallic Spray paint. 🙂 Seriously though, the main part of this apparatus is just a piece of right-angle steel which you can purchase at Home Depot, and any scrap piece of steel for the base. I used J-B Weld Steel Reinforced Epoxy (also available at Home Depot) to hold the three pieces of steel together. I also used two long nails on either side of the bottom edge of the long “V”, I thought it would provide more of a mechanical support for the epoxy. You can see in that photo that it similarly has the two fundamental pieces of angled steel, like mine. also perhaps more importantly the kerf may become airborne glass dust, which you definitely do NOT want to breathe. As with anything involving glass, YMMV, and while this works for me, it may not work for you, and appropriate safety precautions should always be taken. 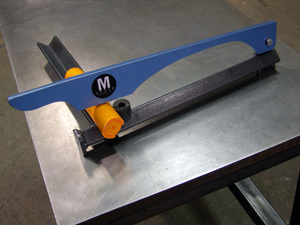 OK, and now we have “version 2” of this glassblowing color bar cutter. More compact and reinforced design. Total weight still just a little under three pounds.